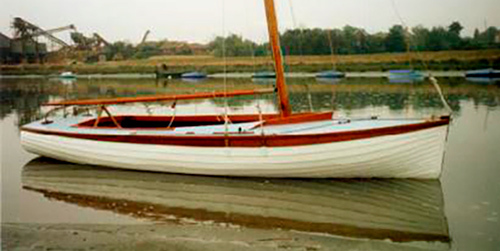 The Wivenhoe One Design is the class dinghy of Wivenhoe Sailing Club. From the turn of the century numerous One Design Classes of boat were designed and the Wivenhoe One Design is one of these. All boats were built to a common design and so the performance each boat was very much the same. It was down to the owners and crew to tune and sail their boats to the maximum efficiency within the class rules. The modern phrase is a “level playing field”. Dr Walter Radcliffe designed the WOD specifically for our local conditions and in 1935 the first were built and launched for under £50. In 1936 Wivenhoe Sailing Club took on the lease of the old hard and oyster shed from Colchester, acquired a second hand chicken shed as a headquarters which you still see today and class racing commenced. I had the honour to own, rebuild (her second), see photo below, and sail No. 2, Duet for 23 years. She was built for Dr Radcliffe and Peter Pawsey, has never left Wivenhoe and is regularly winning races under current ownership. Duet was dropped from the first floor of Wilkins Jam Store in 1977 and declared a total loss until her owners, Walter and Cecily Evans were introduced to Geoff Bailey, an expert in modern glues and a keen amateur boat builder. He saved the boat and gave her the first rebuild. Over the years the fleet had gradually fallen but the enthusiasm of Walter Evans and the support of local sailors led to the formation of the Wivenhoe One Design Association within the Club. Expert advice and encouragement from marine professional David Cannell led to a search for more boats. Elise (No. 17) was brought back from Brightlingsea. Chiquita (No. 15) was found in poor shape at West Mersea and bought for the scrap value of her bronze centre plate. Osprey (No. 19) returned to Wivenhoe. Capriol (No. 11), also originally owned by Dr Radcliffe was found lying in the mud at Tollesbury without mast or gear but basically sound with her original bronze centre plate. The class was growing again. Nick Baker, owner of No. 4 Vivian at Rowhedge, found a note pinned to his mast describing another hull at Gosport. Local sailor Pat Hatch was visiting on business and sure enough, it was another WOD. Pat arranged to bring her back and after much head scratching, well known local man Ernie Vince identified her as the boat he had sailed extensively. She was Coretta (No. 16). Membership of the Association was opened to any interested people and ex owners. The aim was to provide advice and help to owners on maintenance and restoration as well as raise money to buy boats in if there was a danger of them being lost to Wivenhoe. 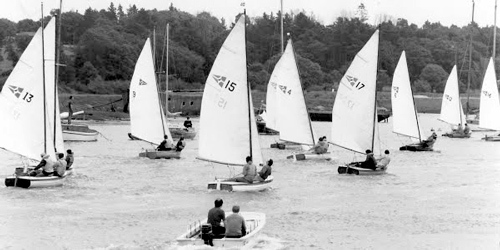 By 1985, their 50th year, we had all remaining 16 on the water for the regatta (see photo below) and what a race that was. Malcolm Goodwin had restored Capriol using modern methods and under the expert helm of Peter Sainty she was soon lapping boats, having led from the start. As in all things the fleet has declined again in recent years and we have lost track of Capriol again because her owner moved. Chiquita has also been sold away recently regardless of her heritage but fortunately we do know of her whereabouts. We can only ask owners to respect the history of the class and keep them here. The Association recently purchased back Vivian (No. 4), although we nearly lost her too. At present there are two boats in need of major restoration and one needing minor work. They are an important part of Wivenhoe maritime history and with a current revival of the Association hopefully they can enjoy a few more years yet. In the early 1980’s they were a cheap boat because no one wanted wooden boats. Now they are still relatively cheap but require time and money to keep them competitive on handicap with modern classes and of course, in their own class. Of the 19 built, 16 were back in Wivenhoe by 1985, the 50th Anniversary. No. 5 and No. 14 are still missing and No. 18 was destroyed in 1973. Two have been professionally rebuilt to new standard in recent years at a cost of about £7,000 each. Thank goodness such skill is at last respected and can demand a fair price. My amateur major rebuild of Duet only cost hundreds but I didn’t price the time! Other owners have also done their own extensive rebuilds thanks to modern materials and glues. We are trying for another revival and hopefully will see more boats back on the water soon.